Umpires must be PONY patched to umpire behind the plate, and at least 16 years old for the bases. A game can be played with just 1 umpire. It is the umpire’s decision to call a game at any time due to darkness. Player safety is always the main concern. If a game is called for any reason, it shall be a complete game if four innings have been completed, or it the home team has scored more runs in three innings or three and a fraction innings, than the visiting team has scored in four completed innings. 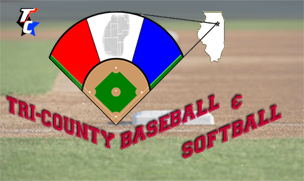 If a game is called for any reason before it is a complete game, as described above, or when the score is tied, it shall be considered a suspended game and shall be resumed from the point of curtailment at the time scheduled by league officials. If a game is called for any reason in an uncompleted inning, after having reached complete-game length as described above and the visiting team ties the score or takes the lead in the uncompleted inning, and the home team does not tie the score or retake the lead in its portion of the uncompleted inning, the game shall be considered a suspended game and shall be continued from the point of curtailment at the time scheduled by league officials. Mustang games are 6 innings long. Extra innings are allowed. There will only be 6 runs allowed per inning until the 6th inning, after which there is no limit. The same applies for extra innings as the 6th inning. In a play at the plate the runner must slide, or can be called out. The umpire has sole judgment on the play. A base runner at 3rd base cannot steal home. However, if the defense attempts to pick off the base runner at 3rd, the base runner may advance at his own risk. An attempt to pick off will be defined as an actual throw or running motion toward the 3rd base baserunner. A base runner attempting to steal 3rd base from 2nd base may not advance home on an overthrow from the catcher attempting to throw the base runner out. A base runner attempting to steal 2nd while 3rd base is occupied may not advance past 2nd, even on an overthrow. In the previous situation, the runner on 3rd base may not advance home, unless a play is made on him as described above. A base runner established at 3rd base may only advance home on a batted ball or being walked in. No stealing is allowed when the ball is thrown back to the pitcher and mishandled. There is no leading off. A base runner can steal only after the ball crosses the plate. A courtesy runner can and should be used for the catcher only, with 2 outs but is not required. If a runner leaves the base prior to the ball crossing the plate and the ball is not put into play by the hitter, the runner must go back. Continuous batting order can be used but is not required. If you start the game with a continuous order you must finish that way. Each team can decide before the game and instruct the opposing coach. The pitching distance is 46 feet. A pitcher is allowed to pitch 5 innings per week in league play. The week starts on Monday and ends on Sunday. If a pitcher throws 4 or more innings he must have 3 days (72 hours) of rest before pitching the remainder of his innings. Time is computed from the start of the game. If a pitcher throws 3 innings or less he is eligible to pitch on 1 day rest (24hours). One pitch consists of an inning pitched. Once a pitcher is removed from the mound and a new pitcher is inserted, he cannot re-enter as the pitcher. The only time a balk can be called is if the pitcher is not in contact with the rubber when delivering the pitch. Three warnings will be given before a balk is called. On an intentional walk, the pitcher can throw 4 balls – or – the defensive coach can motion 4 fingers up to the plate umpire and direct the batter to be walked without a pitch being thrown. A pitcher cannot wear wrist bands or batting gloves. If a pitcher hits 2 batters in an inning or a total of 3 in the game, he must be removed from the mound. Infield fly rule is in effect and must be called by the umpire’s judgment. A defender cannot fake as if they have received the ball in an attempt to fool the baserunner. This could make the runner slide and possibly get injured. Any wood bat that meets the NFHS standards as detailed in section 1-3-2 and 1-3-3 of the NFHS baseball rules book. 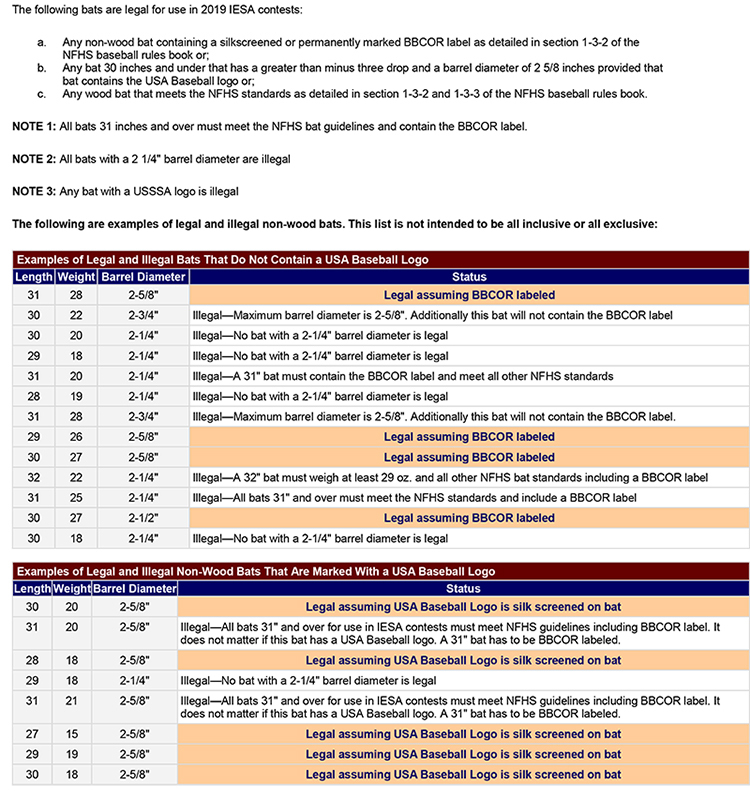 NOTE 1: Any bat 31 inches and over must meet the NFHS bat guidelines and contain the BBCOR label. NOTE 2: Any bat 31 inches and over and has a greater than a minus 3 drop with the USA Baseball logo is an illegal bat. NOTE 3: Any non-wood bat with a barrel diameter greater than 2 5/8" is illegal. A Mustang player may be called up to play on the Bronco team for one week. (2 games). The player cannot play more than 2 Bronco games in one week. If that player is called up to Bronco again he must stay up for the remainder of the year. A Mustang player cannot pitch in Bronco. Only in Tournament play there will be a 10 run rule after 4 innings. Pitching rules for the tournament are the same as regular season with the exceptions stated below. 1 - In 1st and 2nd place game and 3rd and 4th place game there will be no rest rule in effect. 2- A pitcher may pitch a total of (8) innings for the tournament week. REMEMBER NOT TO INJURE A PITCHER JUST TO WIN!! !